As the 2018 hurricane season nears its official end, Connecticut can count itself lucky. The state has not been hit with a hurricane or tropical storm since the successive storms of Irene and Sandy in 2011 and 2012 swamped the coasts, illuminating their vulnerabilities to the effects of climate change not only from storms, but also nuisance flooding from sea-level rise. Yes, lucky again – because a general consensus is that if either of those storms were to hit now, they would be just as damaging. Despite the elevation of hundreds of shoreline homes, scattered improvements in drainage systems and other small infrastructure components, extensive tree trimming around utility lines, and many assessments, there have been only a few modest statewide changes to boost shoreline resiliency – a concept that may prove to be no better than a temporary fix. The state’s shoreline cities and towns, while in some cases well-intentioned, have found the process of addressing their problems slow at best and impossible at worst – with issues of money, political will and private property rights often proving insurmountable. 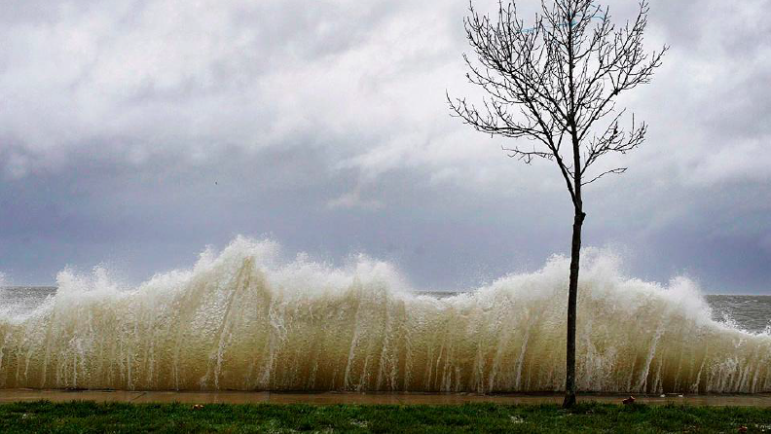 Lending increased urgency to the issue of Connecticut’s shoreline vulnerability is the release last week of the National Climate Assessment that, among other things, details how more intense precipitation and increasing sea level rise threaten the northeast. None of this is lost on the experts responsible for protecting the shoreline. “I think we’ve reduced risk, but could do a better job still,” said Brian Thompson, director of the land and water resources division of the state Department of Energy and Environmental Protection. He cited the creation of the Connecticut Institute for Resilience and Climate Adaptation (CIRCA) – a joint government and University of Connecticut research and funding clearinghouse, and noted the formation of the State Agencies Fostering Resilience (SAFR), an inter-agency workgroup. But he acknowledged that seven years after the first storm hit, with many communities still figuring out where their problems are, shoreline risk reduction efforts have been slow and complicated by unresolved questions about who will pay for the projects. 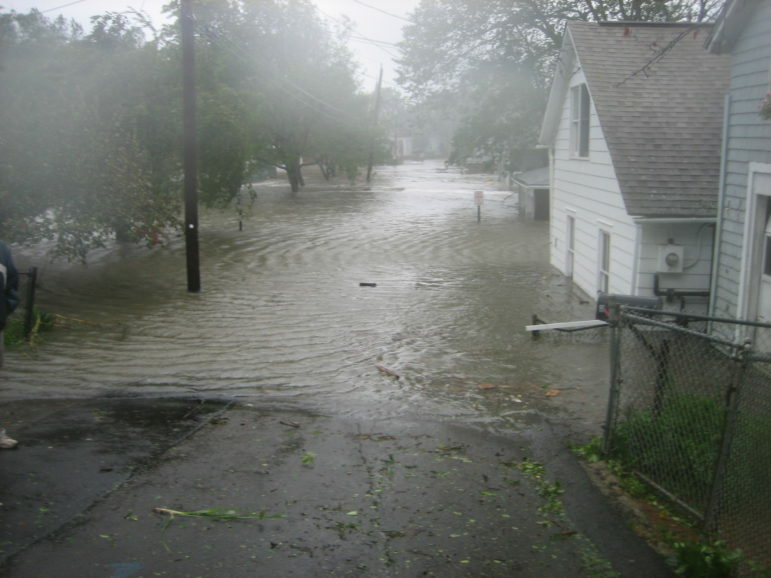 A flooded area of Branford during tropical storm Irene in 2011. Some communities have managed remediation designed to improve recovery time from an Irene or Sandy repeat. But with few exceptions, damaged properties are back where they once were, meaning most of them are just as vulnerable as they were, if not more so, as sea level rise creeps higher and the threat of more intense storms increases. A big part of the problem is the federal government’s flood insurance and emergency management systems, which are designed to replace what was there before a storm. It’s a philosophy that confounds climate scientists and shoreline experts like Rob Young at Western Carolina University who runs the Program for the Study of Developed Shorelines – like Connecticut’s. “The biggest problem is we’re still supporting development in places that are absolutely crazy to be developing,” said Young. He believes very little has changed along U.S. shorelines in the last half-dozen years, including the government funding paradigms for recovery. The Federal Emergency Management Agency (FEMA) has had a buyout program for many years, but nationally it accepts only a fraction of applicants, instead financing rebuilding in vulnerable locations – sometimes multiple times. While people like Young often are regarded as purists who see retreat – the “r word” as it is often called – from the coastline as the only genuine solution, they are also well aware that cities and towns are loathe to give up the taxes paid by owners of pricey waterfront property. West Haven has been just about the only shoreline community that bought into that philosophy after homes along Old Field Creek were devastated by Irene and again by Sandy. Figuring the lost property taxes would be less than perpetual cleanup costs – to say nothing of the perpetual anxiety of homeowners – 20 of those homeowners opted for what essentially are buyouts through the Natural Resources Conservation Service of the federal Department of Agriculture, which grants floodplain easements to vulnerable homes, though not the most vulnerable ones. But in the rest of the state, the numbers are sparse. There are fewer than a handful of additional property owners in three of Connecticut’s 24 shoreline municipalities that are doing the same as those in West Haven. Home elevations are far more common – and often required in cases of severe damage to homes with mortgages. But with flooding from lesser storms than hurricanes and sea level rise leading to nuisance flooding, such as during high tide full moons, elevated homes may stay dry, but frequently may wind up being difficult, if not impossible, to reach. In the meantime, he and others say, communities have to start making longer-term decisions. But given that municipal planning cycles are generally five to 10 years, longer term climate predictions are less reliable than shorter ones, and the general taxpayer antipathy to spending public money for something they may never see means that such planning typically doesn’t get far. Other complications come from the recognition that it’s impossible to eliminate risk, or at least do it at a price anyone or any government can afford. That leads to a battle over how much risk a community is willing to accept. And once you get into a cycle of rebuilding – with or without risk – the natural instinct is to continue to protect your investment. Keeler and others recommend that municipalities, and even individuals, come up with a system to trigger actions on some pre-announced schedule for an observable variable – such as agreeing to rebuild a bridge until sea level rise hits a particular point. “The virtue is you’re not making anybody do anything immediately, but you’re telling the market to start to price in –‘gee this is going sunset,’” he said. Connecticut is taking baby steps, however. Much touted legislation passed in the last General Assembly session incorporates the sea level rise projection that CIRCA is required to report every 10 years, and which is now estimated to be about 20 inches by 2050, as a consideration for various state and municipal planning documents. But there’s no requirement to do anything other than consider CIRCA’s projection unless it involves a project in a coastal zone that receives federal or state money. Tide gates at Pine Creek in Fairfield. Band-Aids, said Bruce Hyde, land use educator for the University of Connecticut’s Center for Land Use Education and Research (CLEAR). That’s the word Hyde and others use for the kinds of solutions towns use now – elevations of building and roads, tide gates to release water, barriers around infrastructure like wastewater treatment plants, and sub stations. Since people don’t want to spend money now for something they think won’t affect them, Hyde recommends the state’s coastal towns start building in budget allowances for long- term sea level rise and climate-change impact remediation. This would include everything from moving gas stations or hospitals that are in flood zones to figuring out how to make up for the loss of taxes from homes that are no longer inhabitable. Statistics from various sources show there’s a lot the state ought to be worried about even without another Sandy or Irene – let alone a major hurricane like this season’s Michael or Florence. Any number of interactive mapping tools show large swaths of the state’s shoreline that are already in flood zones, destined to be underwater in multiple sea-level rise scenarios. The National Climate Assessment offered grim scenarios of increasing heat, drought, fire, intense storms, and floods, with pronounced economic losses for the U.S. economy as a result. The report, which was released by the Trump administration the day after Thanksgiving, is congressionally-mandated every four years. For the northeast in particular the report focused on issues of flooding related to sea level rise and more intense rainfall, particularly in relationship to existing infrastructure that is old and inadequate, and development along the shoreline. The report said ocean warming in the region from 2007 to 2016 was four times faster than the long-term trend, and sea-level rise projections were greater than the global average projections and could be higher than 11 feet by the end of the century in a worst-case scenario. NOAA’s 2017 State of U.S. High Tide Flooding Report and 2018 Outlook found that three of the top five cities with the highest number of flood days, and which broke records, were Boston, Atlantic City, and Sandy Hook in New Jersey. Connecticut, of course, is right in the middle of them. For places like the Long Wharf area of New Haven, built on fill in what was once a harbor, the end game could be catastrophic. NOAA’s prediction is that when this meteorological year ends in April 2019, high tide flooding will be 60 percent higher than it was 20 years ago and double what it was 30 years ago. Using tide gauge data and information from the real estate group Zillow, the Union of Concerned Scientists calculated the risk to just shoreline homes – not commercial properties, infrastructure or anything government owned – nationwide from the kind of chronic inundation related to sea level rise. That’s without storms. For Connecticut, NOAA determined that by 2045 there will be about 4,500 homes at risk just of chronic inundation. Those homes are currently valued at nearly $3.5 billion and contribute more than $52 million in terms of property taxes. 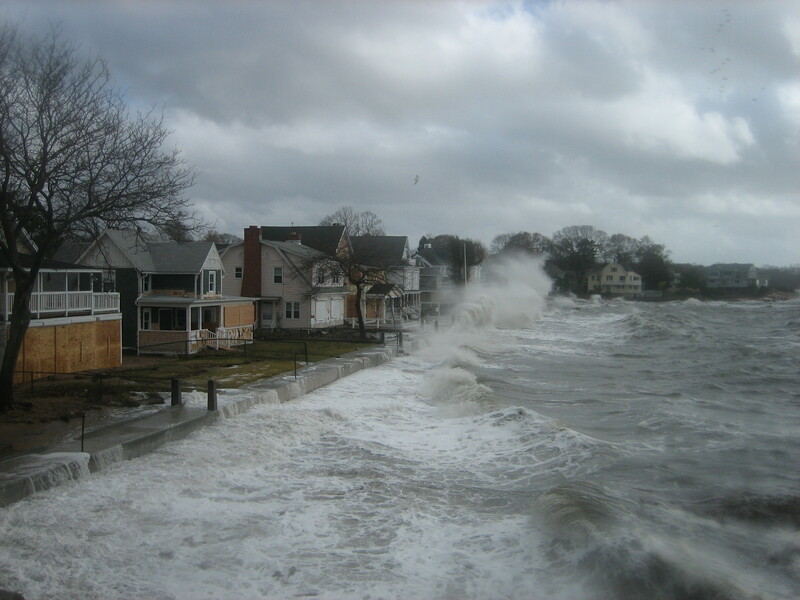 By the end of the century, with a high sea level rise scenario, Connecticut would be looking at about 25,000 homes at risk with a value of nearly $15.5 billion and property taxes of more than $252 billion. Fairfield tops the list for both number of properties impacted and their value. But do homeowners in Connecticut typically have flood insurance to help deal with potential catastrophes? Don’t count on it. After spiking following Irene and Sandy, the number of flood insurance policies in Connecticut have dropped again. It’s just that they aren’t doing enough. Because Connecticut is a home rule state, state government is limited in many ways in terms of what it can mandate. Local regulations on climate change resiliency or land use and other zoning policies are left to individual municipalities to determine. For example, a number of shoreline communities are largely or entirely serviced by septic systems, not central wastewater treatment facilities. Sandy and Irene ripped many of those septic systems right out of the ground, exposing pipes, flooding them, and risking releasing sewage into Long Island Sound. While it’s clearly more efficient and effective from an environmental standpoint to get rid of septic systems, the state can’t force towns or property owners to do that. 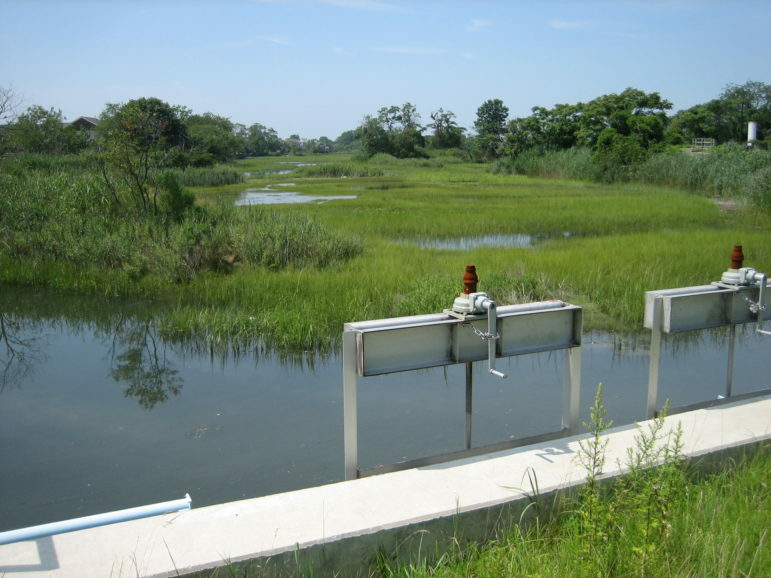 The Department of Public Health, which oversees septic, also has no statewide standard for new septic systems to be able to handle sea level rise, which doesn’t even have to be considered unless state funding is involved. It’s been discussed, Perry said, but she doesn’t expect any concerted policy consideration in the near future. Meanwhile, it’s left to the towns. Perry said there are scattered individual efforts to switch some beachfront private neighborhoods to sewers, but that’s about it. The state Department of Transportation has quietly upped its game on preparing for climate change and the potential for more intense precipitation and runoff. The state is using stricter standards to control runoff and employing green infrastructure solutions to help address the problem. Arguably the biggest statewide change involves the state’s building code and that’s one area where the state – not local government – rules. Cities and towns must follow the state code, though enforcement of it is local. After years of being woefully behind in implementing the International Code Council regulations, the state has caught up, putting the 2015 building code into effect on Oct. 1 while preparing the implementation process for the 2018 code. In doing so, the state has put in place a number of provisions that increase the resiliency of residential structures along the shoreline. New construction and renovation in vulnerable areas – especially between I-95 and Long Island Sound – will need greater wind resiliency, including impact resistant glass that can handle even higher wind speeds and stronger structural components. But if a home is just being elevated – those enhancements are not required. “That’s mission number one of things we’re going to look at towards resiliency for the next code cycle,” said Joseph V. Cassidy, the state building inspector. The building code also allows individual communities to set their own standards for how high a structure has to be elevated when necessary. While most still just require FEMA’s standard, known as base flood elevation, several towns require additional elevation – known as freeboard – which can mean anywhere from an extra foot to three feet, depending on the community. George Bradner, property and casualty director with the Connecticut Insurance Department, lobbied from the time Irene hit in 2011 for more stringent standards. He called the building code changes a huge win, but wished they had gone further. “We’re taking small steps,” he said. “It’s just the economics. People don’t want to have to spend the dollars to incur those costs.” That’s despite studies showing you save $6 for every dollar spent on disaster mitigation projects. Bradner would like to see the federal government spearhead an incentive system that offers higher reimbursement percentages to a state after a disaster if the state implements stricter climate change mitigation practices. And he wants shoreline cities and towns to begin to embrace the reality that homes and other buildings may not be able to remain close to the water indefinitely. “There is research that shows that if towns started planning now, taking climate change into consideration, over time you can change that tax base so you’re moving people away from that hazard and you’re not having the severe tax effect you’d have if you did nothing,” he said. That means changing land use policies to keep new construction away from vulnerable areas. And maybe considering a radical change to flood insurance, such as a community flood policy in which a town assesses all homeowners for flood insurance that covers everyone – coupled with stronger building codes so people elevate and strengthen homes. Homeowners who don’t live in floodplains would benefit because they’re the ones that pick up the tab if a community starts losing its tax base to climate change and sea level rise. Jake Kara contributed to this story. This story was funded in part through a grant from Ethics and Excellence in Journalism Foundation, administered by LION Publishers. Jan Ellen Spiegel Jan has won awards for her reporting on energy, environment and food and agriculture. In 2013 she was the recipient of a Knight Journalism Fellowship at MIT on energy and climate. She is a former editor at The Hartford Courant, where she handled national politics including coverage of the controversial 2000 and 2004 presidential elections. As a freelance reporter, her stories have appeared in The New York Times, The Boston Globe, and elsewhere. She was an editor at the Gazette in Colorado Springs and spent more than 20 years as a TV and radio producer at CBS News and CNN in New York and in the Boston broadcast market. She graduated from the University of Michigan and attended Boston University’s graduate film program.